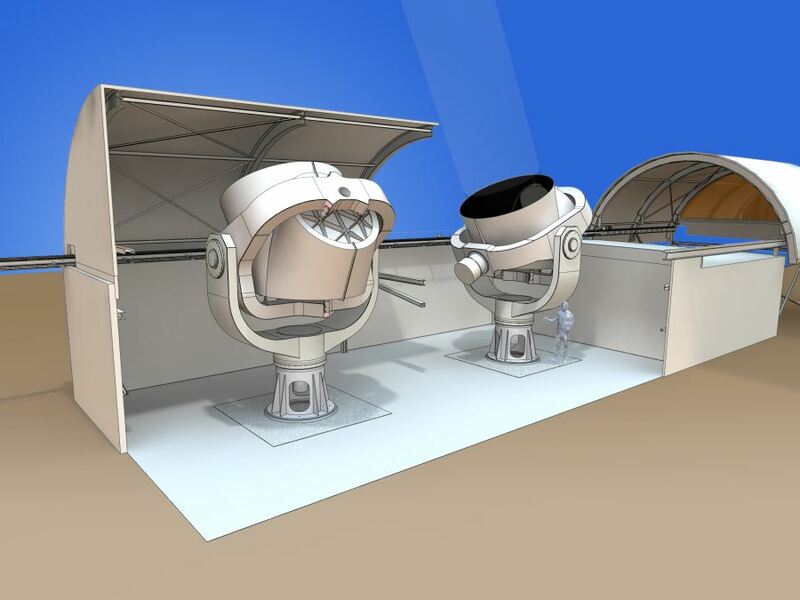 Artists impression of the QUIJOTE telscopes in Tenerife. The Q-U-I JOint TEnerife (QUIJOTE) experiment aims to observe the polarization of the Cosmic Microwave Background on large angular scales (around 1 degree) at a number of frequencies between 11 and 30 GHz. QUIJOTE will be a unique instrument for studying the low frequency CMB foregrounds (synchrotron, free-free and anomalous emission) as well as placing constraints on CMB B-modes. It is a collaboration between the Jodrell Bank Centre for Astrophysics and the Cavandish Laboratory, the Instituto de Fiscia de Cantabria, the Departamento de Ingenieria de Comunicaciones and the IDOM company. It will observe from the Teide Observatory.